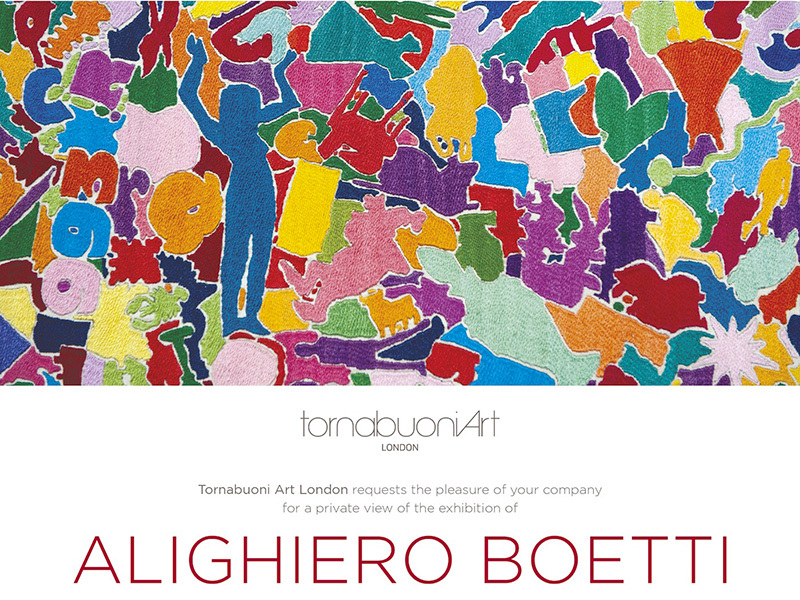 Tornabuoni Art London currently presents a solo exhibition of Italian conceptual artist Alighiero Boetti. The show is an homage to Alighiero Boetti’s career and the influence of his work. The exhibition presents a selection of the artist’s rarely seen artworks articulated around the original Il Muro (The Wall), shown for the first time in a commercial gallery. Alighiero Boetti’s Il Muro, originally conceived in Boetti’s apartment in Trastevere in 1970, evolved throughout the artist’s life and only reached its final state upon his death in 1994. It is composed of 74 pieces including 15 of the artist’s own works, five drawings by his daughter Agata and a photograph of her as a child. One can also find various memories and newspaper cuttings such as the announcement of Pablo Picasso’s death on the front page of the Kabul Times, a map of the most important waterfalls around the world and several original photographs. Boetti took Il Muro – simultaneously a record of his experimental artistic practice and a source of inspiration – with him to each of his subsequent studios, suggesting that the work’s vital importance as an integral part of the artist’s creative process. The exhibition at Tornabuoni Art London aims to bring the artist’s evolution to the fore, from his initial sources of inspiration to the artist’s most sought-after works, highlighting the essential tensions within Boetti’s production: private and public life, authorship and appropriation, introspection and geopolitics, finished and unfinished, planning and chance. “We are honoured by the trust of Agata Boetti, who is generously allowing us to bring Il Muro – not displayed since 2013 – to the London public,” says gallery director Ursula Casamonti. Alighiero Boetti at Tornabuoni Art London. Private View, October 3, 2016. Alighiero Boetti. Il mondo fantastico.